Similar to massage, using the foam roller to gently massage your muscles, may just be the key to improving post-workout recovery. Grab a foam roller and roll out your quads post-workout. Begin kneeling on the floor. 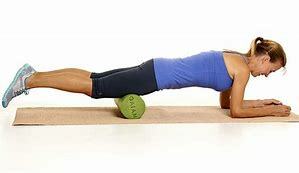 Place the roller across both thighs. Move your body forward over the roller, supporting your body with your forearms and elbows. Roll up and down your thighs, about 3-4 inches, in total. Start with 20 seconds of rolling. Stop if you feel pain. *Consult your physician before performing exercise. Work your core and legs together with this super-effective exercise. Begin without weight and master form first. Here’s how: Lie on your back, with both knees bent and your feet flat on the floor. Next straighten your right leg and lift it up so your heel is facing the ceiling. Next, raise your right arm straight up so it is also perpendicular to the floor. In one motion, lower your right leg so it’s parallel to the floor, and your right arm straight overhead. Exhale and return to your starting position. Begin with 10 reps, then release. Keep your belly button in tight and your torso still. Repeat with your left leg and left arm. *This exercise is for intermediate exercisers without injury concerns. Build your bridge exercise for leg and core strength. Begin lying on your back with both knees bent and your feet flat on the floor. Pull your belly button in toward your spine, squeeze your glutes and lift your hips up about 6 inches. Maintain this position, and lift your right foot up off the floor. Slowly lower your right foot to the floor. Keep your hips up and lift your left foot up off the floor, and then lower your left foot to the floor. Do 10 reps total, and then release your hips to the floor. Are You Up For a Double Ab Challenge? Double up on your ab challenge with this crunch-plus exercise. Begin lying on your back on the floor. Hold a stability ball between your ankles and knees. 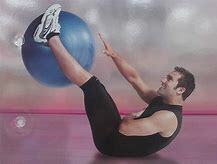 Next using both legs lift the ball up off the floor and stabilize your hips and legs. Then perform a traditional abdominal crunch. Holding your legs still while performing a crunch adds an extra ab challenge. Build total leg and core strength with this floor exercise. Begin on your hands and knees. Keep your back aligned, torso stable and belly button up tight. Lock your shoulders down into your body. Lift your right leg up off the floor, and bend your knee. Push your heel up toward the ceiling about 6 inches, then lower. Do 10-15 reps, then release. Repeat lifting and lowering your left leg. Begin seated on the floor. Place both hands flat on the ground just under your shoulders. Place both feet flat just forward of your knees. Lift up your hips. Hold for 10 seconds. Pull your shoulders down into your body, squeeze your glutes and pull your belly butting in toward your spine. Begin lying on your back. Place both arms flat on the floor along side your body. Lift both legs up off the ground and move them in a bicycling motion for a count of 10. The key is to keep your torso and hips from rocking or shifting weight from side to side. Breathe as you go and focus on keeping your shoulders down flat on the floor. Isometric exercise means your muscles are holding a position tight, without movement. Try an Isometric Ab-Hold exercise to strengthen your core. Begin seated. Place both arms along the side of your body for support. Next slowly lean back until you feel your abs engage. Next, lift both legs up off the floor. Breathe normally. Hold for a count of 10 seconds, then release. Begin seated on the floor, with both legs straight out in front of you. Gently tuck your chin to your chest and bend forward, reaching straight out with both hands. Hold for one or two deep breaths, then slowly return to your upright posture. Ready to Challenge Your Plank? Begin in a plank on your hands and toes. Next, keeping your body still, lift your right hand and touch your left shoulder, then return to the floor. Repeat, lifting your left hand and touch your right shoulder, return your hand to the floor. Do 10 reps, slow and controlled. Sign up to receive the latest health news and updates via email!